I’ve been a habitual IRC user since about 1994.Â IRC is a chat program, a little different then AOL Instant Messenger or Skype.Â AIM and Skype are generally used as one to one communication.Â I’ll connect to someone and chat with them.Â IRC is a little different.Â I connect to a “room” and I chat with the people in the “room”.Â A one to many chat program.Â I like it because, well, it’s like going to a bar.Â You connect to a room (there are THOUSANDS of rooms), and you’ll notice that the same people tend to hang out in the same rooms.Â Over time you develop relationships with people.Â I’ve been chatting with the same people every day for something like 16 or 17 years.Â They are located all over the world. 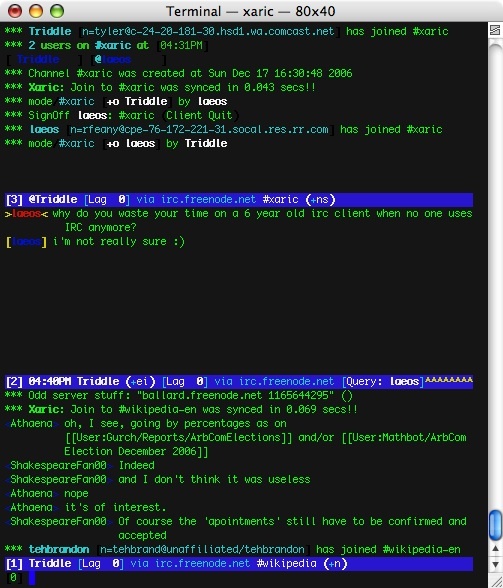 IRC have several networks, two of the biggest are EFnet and Undernet .Â These networks are made up of servers all over the Internet.Â You connect to one of them with your IRC client, and you can talk to people connected to other servers on the same network. you can be in multiple channels, and there is no limit to the number of people there are in a channel.Â I tend to gravitate to the technical channels (#unix, #unix2, #C, #java, #C++), but there are plenty of non-technical channels as well.Â There are channels based on ANY number of topics. At any rate, you can always find me on Undernet.Â I may not talk to you though.Â I stay logged in 24 hours a day, I just may have stepped away or be looking at something else. I think of it as white noise for my computer screen, the way lots of other people listen to music while they are working. 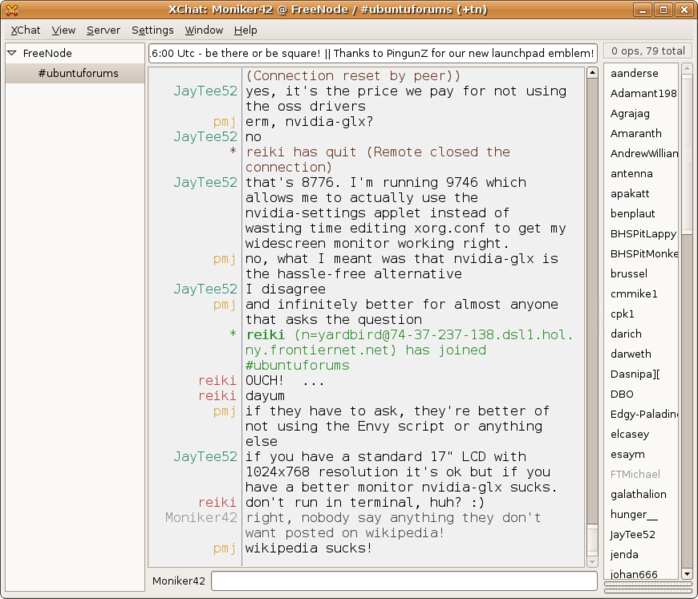 Â People come and people go on IRC, but I’ve also known a number of people for more then a decade.Â We meet up on line each day to say hi to one another.